Feeling stressed out from all that traffic you sit in every morning just to get a few miles to work? Tired of fighting for a place on the rush hour subway? Check out electric skateboards. An easy way to get around without worrying about staying in your lane. Some electric skateboard one wheel models are great for fun rides. We’ve put together some electric longboard reviews to help you choose which one is right for you. Motor - The motor decides how fast you go, so what’ll it be? A motor with more power allows you to cruise through the city at top speed, but may also be cruising through your battery. A smaller motor prevents the board from getting you to top speeds. Top Speed (MPH)- Feeling fast and furious? Choose a board with a higher top speed, and feel the wind on your face as you cruise by all those suckers in their cars. Just getting started? A slower speed might be right for you to learn on until you’re ready to upgrade. Regenerative Brake- A regenerative brake allows the board to collect and store the energy that the board gets when it stops. An electric skateboard battery pack will keep moving longer with a regenerative brake in place. Regenerative braking can be an expensive system though. Size- A bigger board can pack a better punch, in terms of power and control. But if you’re looking for something you can throw in a backpack or a locker when you get where you’re going, a smaller board may be a better fit for you. Smaller boards can also be lighter. Weight- Similar to the size, weight is an important thing to consider when thinking about portability. The weight of the board can be heavier when decked out in more powerful equipment, so if that’s important to you, it may be worth the weight. Warranty - Does the board come with a warranty? This can be something important to consider. What if the wheels fall off a week in or it stops working? Some companies will replace your board, while others won’t. Warranties can also come with a higher price tag. We know choosing a board can be tough so we’ve put together a stellar list of electric skateboard reviews to help you choose the best one. If you’re itching to get riding- check out our top and budget picks. They’re our top contenders, but if you really want to make an informed decision read all the way to the end. What are you waiting for? Let’s get riding. The top electric skateboards are waiting for you. Our top pick is one of the top rated longboards on the market now, the Boosted 2nd Generation Dual + is a powerhouse of a board. Its top speed is 22 mph, something meant mostly for pros. The board looks incredible too. We’re fans of the sleek minimalist design and the pop of orange. The wood grain along the bottom is beautiful as well. The echo on the front design is subtle as well. It has 25% grade hill climbing, ensuring that you can cruise around even San Francisco on this baby. The wireless remote is small and should fit easily into your hand for comfortable control. The board itself handles well and stands up to regular wear and tear. It charges quickly and even pairs with your phone to let you know when it’s done. The Boosted board is all around a great ride and its fans say nothing but good things. It’s a great board for adventurous city commuters and thrill seekers alike. Looking for the best budget longboard? Your search may be over, the ACTON Blink Lite is a great budget pick. According to ACTON, it’s the world’s lightest electric skateboard, weighing in at 7.7 lbs. This makes it perfect for carrying with you anywhere and throwing in a backpack. 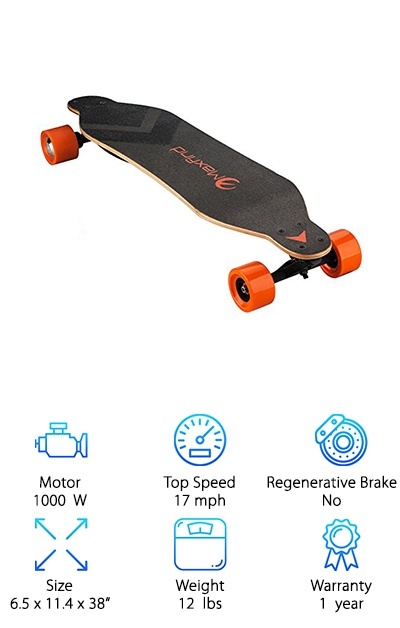 It can take you up to 5 miles on a single charge and is perfect for younger or less experienced riders looking to get started with electric skateboards. It has built-in safety lights to ensure riders are visible to traffic or pedestrians both day and night. It comes with a portable Bluetooth remote control to turn your board on or off and change directions while you ride. 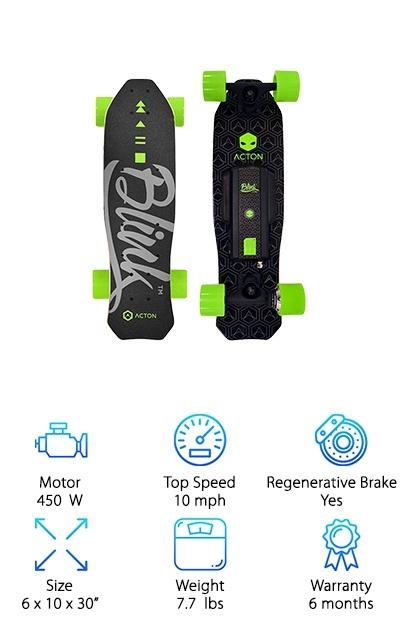 The board’s design is pretty cool, with neon green wheels and the bottom of the deck has a modern modular design. 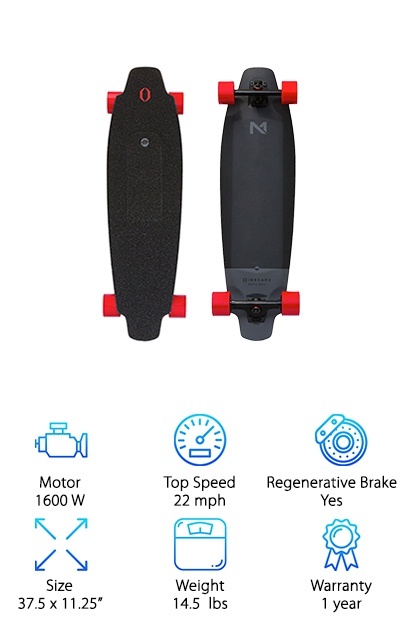 It fully charges in about 2 hours, but if it ever runs out of battery it can function as a longboard. The SKATEBOLT Electric Skateboard is a massive board that can take you up to 25 mph. This makes it perfect for riders with a need for speed on their morning commute. It’s dual hub motors allow it to propel riders of up to 280 lbs. The deck is made of 9 layers of 38” Canadian maple, ensuring it’s strong enough to hold that weight and perform at it’s best. Because of the two motors, it runs for about an hour. It recharges in 2-4 hours so plugging it in when you get where you’re going should be fine. It had regenerative braking as well, which allows the board to gain energy when it is stopping and reuse that energy to power the board. It is graded for 25-degree hills and should be able to climb well. It also comes with a wireless remote to control the speed and direction of the board. It also comes with an IP33 waterproof rating. 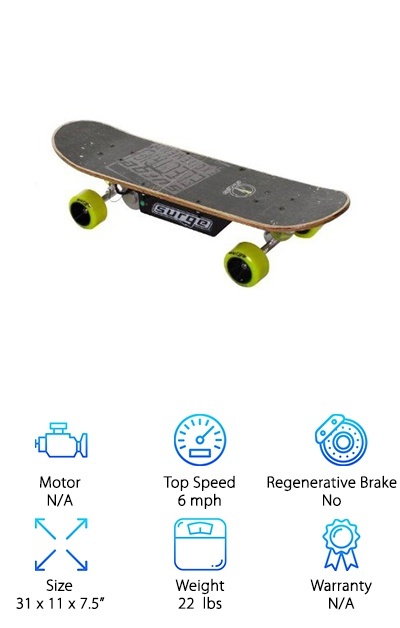 This electric skateboard is a great choice for someone who’s not ready to splurge on a top electric skateboard but wants to get their feet wet with a good board. It’s only about 12lbs but still packs a big punch. It has dual 500 W motors, allowing it to go up to 17 mph and ride for 7 miles on one charge. This board also has built-in LED lights as an important safety feature, you’re sure to be visible to other passing motorists! There are two riding modes, allowing the rider to have more control over speed and performance. It’s built from Canadian maple, allowing it good flexibility and bounce within the deck. This also ensures its a strong board, with the ability to hold up to 220 lbs. They also have a year refund if you're not happy with the product and a service point within the US, meaning repairs can be done quicker and with more efficiency. The trucks are strong and the bright orange wheels make it stand out in a crowd. The Atom H.4 is a great little electronic skateboard, weighing in at only 8 lbs. It has a full Canadian maple kicktail deck and looks a lot like a traditional skateboard. IT can be ridden both on and off, meaning that if you run out of charge you’re not stranded. Or, if you’re feeling like kicking it old school this board can do that too. There are tow speed modes- fast and slow. Slow mode is great for training or driving down a busy street, and the fast mode is for letting it all loose. The deck has a smart lightning bolt design, that is eye-catching without being loud. This board comes with a remote that fits well in your hand, allowing you to seamlessly control the board as you ride. The suggested max weight for a rider on this board is 165 lbs, so it is well suited for younger or smaller riders. The board is great for commuting to school or work. The Dynacraft Surge Electric Skateboard is a little titan of a board. 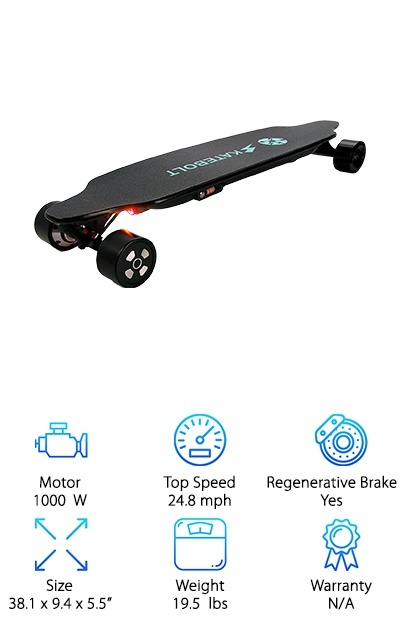 It’s designed for children 8 and older, so it’s great for a young rider who can’t wait to get started with an electric skateboard. The highest speed is 6 mph, so parents don’t need to worry about their children going too fast on a board. It’s small enough to hold a younger rider easily, but not so small that they’ll outgrow it in a year. It comes with a wireless remote with a trigger function to make the board go faster and slow down. It’s neon green and matte black coloring make it stand out. This board is the perfect gift for any young adventure seekers in your life, or for anyone who wants to get started early with electric skateboards. Its range is about 4 miles, ensuring that it can stand up to your neighborhood. This little board is a great fit for young boarders. 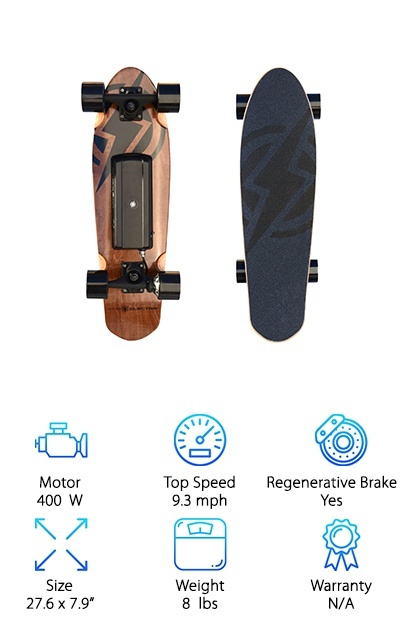 A powerful top rated electric skateboard, the Inboard M1 Electric Skateboard is a great choice for riders looking for something that can stand up to a lot of city streets. It comes with an easily swappable battery for riders that need to go further than 7 miles in a single trip. The unique design of the remote is ergonomic and closer to a gaming remote. This allows for intuitive control and an easy grip. It comes with its own carrying case, which makes it easy to stow your board when you get where you’re going. It has integrated LED safety lights, so you know you’ll be seen by everyone when you ride by on this beauty of a board. There are four-speed modes, which allow the rider maximum control over riding and speed. The modes range from slow and gentle to fast and furious. This makes it a perfect board for riders of all ages, allowing for maximum family fun. 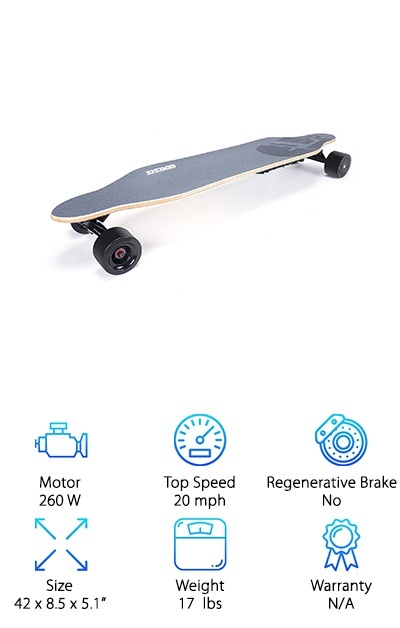 This small electric skateboard is the perfect fit for any student! It fits well in a locker and is light enough to carry around in your backpack. It’s a good budget board as well and is a great fit for students and younger riders. The shape is similar to a traditional skateboard, so it’s intuitive for people who are new to electric skateboarding. The max capacity for this board is 177 lbs, ensuring it can transport most riders. It comes with its own wireless remote, which allows the rider to push to either increase or decrease speed. The design is simple, yet still, stands out with grey lines and siding. The motor is housed in the wheels, which allows it to deliver on power. According to Genesis, it charges in about 2 hours and will ride for about 6 miles. It is made of 8 ply Canadian maple wood, which means it can stand up to both the riders weight and their riding style. This board has it all, it’s light, fast, and goes for a long time. This little board weighs in at 11 lbs, which isn’t the lightest of the boards, but for what you get on performance that’s pretty impressive. 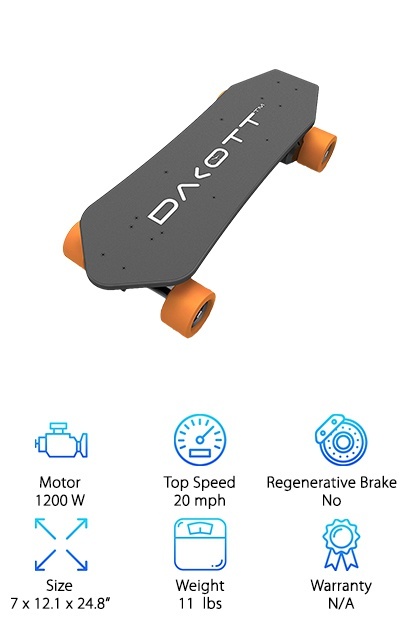 It can go for around 17 miles, according to Dakott, which is more than enough to get you through your day and then some. Its load limit is 250lbs, which means it can carry most riders comfortably. The 7-inch aluminum alloy gravity casting trucks are great for maneuvering around city streets. It comes with 80% rebound wheels and 9-speed bearings, which is great for riders who want to put their boards up to some intense riding. It recharges quickly, in about 2 hours. It looks great doing it too, with stylish orange wheels and a black deck. Perfect for riders who are looking for a combination of value and performance, the Dakott 1200W definitely delivers. 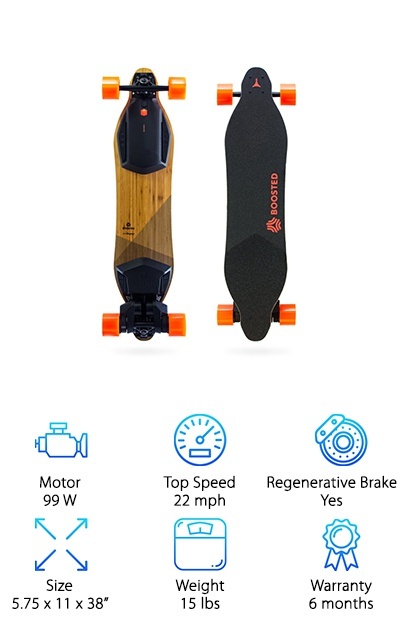 The Genesis Tomahawk Electric skateboard is a great pick for riders who are looking for a budget longboard style board. 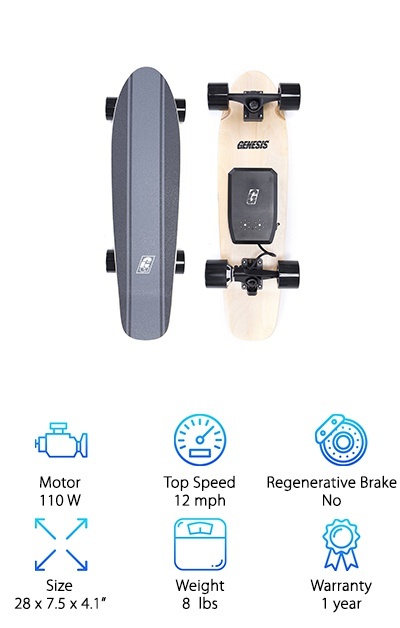 Made by one of the best electric skateboard companies in the business, you can be sure that a GEnesis skateboard will stand up to your busy life. This board allows you to cruise along at max speeds of 20 MPH for more than 20 miles, making sure you get the best out of your board. It’s 3.7 lb battery recharges in under three hours. You can ride your board straight out of the box, so there’s no waiting around for assembly, just get straight to riding. The remote fits easily in your hand and allows the rider to control the speed easily as they cruise along. It can tackle hills of up to 15 degrees, making sure that you can ride without worries. This Genesis board provides an easy and reliable way to get around the city without worrying about gridlock or traffic.